Commission to John de Cobeham, Robert Bealknap, William de Horne, Simon de Kegworth and Thomas de Garwynton to survey the coasts of the isle of Thanet and to have all places in which ships or boats can put in defended by walls and dykes where possible, and all other necessary measures taken for defence of the island. Appointment of William Tidecombe and John Fraunceys to take in the county of Kent labourers and workmen for the repair of a wall standing by the sea-shore in the isle of Thanet, called Saint Nicholas by Sarre, by the breaking and ruin of which great damage to the people of the adjacent country is feared, and to put them to the works at the king’s wages. Appointment of Robert Bealknap, Stephen de Valoynz, Thomas Fog, William Septvauntz, Nicholas atte Crouche, William Makenade, Thomas Garwynton of Well, Thomas Chiche of Balnerle and William Tytecombe, as the king’s justices, to survey the condition of the isle of Thanet, the king being informed that divers inhabitants daily withdraw therefrom, that the walls of earth and the dykes formerly constructed for defence against hostile invasions are weak and in ruins, and that divers persons of that island, bound to find and maintain boats and other vessels for the passage and carriage of men and animals to and fro, have neglected to do so. They are to enquire who are so bound and to compel them thereto, as well as to repair the walls and cleanse the dykes, and those who are withdrawing to remain or find others in their place, with power to hear and determine the premises. The reference to ‘hostile invasions’ suggests that the walls of earth were there to protect against foreign forces as well as against the sea. These rates were confirmed by the Lord Wardens of the Cinque Ports, who from time to time renewed and altered the Decrees made for Ordering and Management of this little harbour. The oldest we now have, are dated September 1615, and confirmed by Edward Lord Zouch, St. Mauer, and Cantelpe, Lord Warden, Chancellor and Admiral of the Cinque Ports. In these orders &c it is said that they have been usually confirmed by the Lord Warden for the time being, and Time out of Mind, used by the inhabitants of Margate and St John’s in the Isle of Thanet. Membership of the Cinque Port system had many advantages for Margate, the principal one being that the town was exempt from many of the taxes and regulations governing the rest of Britain, as described in Chapter 5. Sometimes, though, exemption from regulation proved to be a disadvantage, as was the case with exemption from the regulations governing sea defences. Sea defences were normally the responsibility of the Commissioners of Sewers, a body concerned with land drainage and the prevention of flooding, not with the removal of sewage in the modern sense. The authority of the Commissioners dated back to the Statute of Sewers 1531, passed in the reign of Henry VIII. This gave the Commissioners, appointees of the Crown, the power to levy drainage rates on the occupiers of land benefiting from any drainage or sea defence works carried out on behalf of the Commissioners. The problem was that it was uncertain whether or not the Commissioners were responsible for flood defence work in the Cinque Ports. Figure 23. 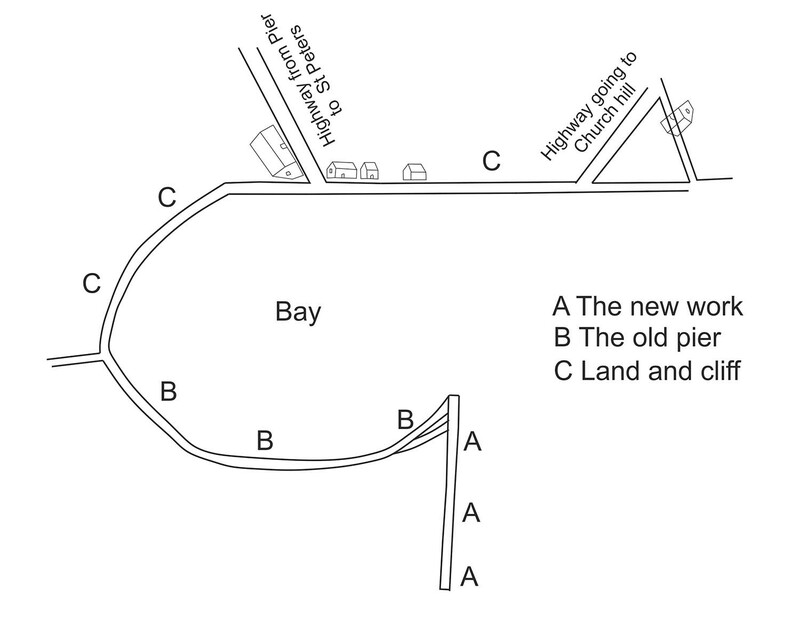 A sketch of the Pier in 1646 based on the Harleian manuscript in the British Library. TO all Christian people to whom these Presents shall come: JOHN GOLDER Gent. Mayor of the Town and Port of Dover in the County of Kent, and the JURATS of the same, send greeting in our Lord God everlasting. Exam. per me Fra. Raworth, Com. Cler. Vil & Port Dover. The Gentlemen appointed for [the survey], promising to come to Margate, I provided a dinner of my own charge for them, but two only came, who told me they could do nothing of themselves without another: Thereupon I intreated them, though they wanted one of their number, they would give way to some Workmen to measure the works, whereupon workmen were sent for, so I procured three Carpenters, who measured 55 rods of work, which they cast up, and they conceived every rod of work would take up five tun and a half of tymber for single work, and double work would ask as much more; It was two moneths before I could get them together, after I was forced to make severall journies to Dover-castle to procure Major Boys Governour thereof to Margate, and going often thither for that purpose, I hapned to meet with Sir Henry Heyman a Parliament man, with whom I made bold to lay open our grievance to him; whereupon he was perswaded to go to Margate with me, and at my request he desired and gained Major Bois to go with him: Upon view of the works, they found the same was gone to ruine, and that the Peer of Margate was the cause of the destruction of a great part of the Town, and this Peere was accustomed to pay scot to the said works, but for these four years and upwards hath not paid one penny, yet some particular men make a benefit of the Peer mony, which can be proved by very able witnesse. 1. That there was Fifty-five Rods of Work measured, and found in Decay, each of which Rods was conceived would take up Five Tons and Half of Timber for Single Works, and for Double Works so much more; and the same requiring all Double Work, it will take up in the Whole Six Hundred and Five Tons of Oaken Timber. 2. That the Workmanship, for Carpenters, Sawyers, and other Workmen, will amount to as much or more Charges than the Timber to compleat the said Works. 3. That it will require a constant and continual Charge, in repairing, upholding, and keeping, the same Works. 4. That if the now Expenditor John Smith may be Yearly allowed Twelve Pence in the Pound upon all Houses and Lands, which for Twenty-five Years past paid Two Shillings in the Pound, as appears by Scot; and also if he may receive according to the Rates of and upon the particular Commodities set down and expressed in a Schedule hereunto annexed, and as this Honourable House shall think fit, and as is used in other Maritime Towns; he is willing to undertake to perform the said Work, being furnished with Timber sufficient as aforesaid; and will engage One Thousand Pounds, Lands and Houses in the said Island, for Performance and Keeping of the said Work for ever; he being the fittest Man for the same, as being already intrusted for by the said Town, and the said Town being now in most imminent Danger to be lost if not speedily helped as aforesaid. 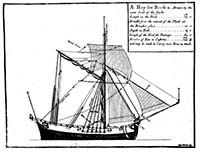 Having about Eight Months past, with the Lieutenant of Dover Castle and Mr Henry Crispe, surveyed the dangerous Condition of Margatt; I did find that there is Fifty-five Rods, or thereabouts, which of Necessity must be maintained against the Rage of the Sea; and did also find, by the Judgement of able Workmen then present, that the Premises will require the Timber here above-mentioned. That about 25 or 26 years since, there was a peece of work added to the said Peer of Margate, which had proved very advantagious for the Peer, but desperately ruinous for part of the said Town. That before the making of the aforesaid new peece of Peerwork, it is not known to any man living that ever there was any work at the shore for the defence of any of the houses of Margate, or that there was any need of any such work; but since the making of that new peece of Peerwork, there hath been as much Tymber-work set down by the Inhabitants at the shore for the defence of the houses there, as by credible relation hath cost them fifteen hundred pounds and upwards, the which is now wholly ruined by violence of the sea. Whereupon we conceive, that if the Peer be continued as now it is, the Town must suffer; and if the Peer do not continue as now it is, the Peer will quickly fail, and the Publique suffer for want of trade. The houses at Margate now in danger, are conceived to be near the fourth part of the Town, and will require fifty five rods of new work, which wil take up five tun and a half to every Rod of single work (by the judgement of the best experienced workmen) For which, they are humble suitors to your Lordships. James Oxenden, Kt., Major Boys, Esq., Henry Crisp, Esq. On Consideration of a Petition presented to the Committee, by John Smith, Expenditor for Margett, in the Isle of Thanett, in the County of Kent, in Behalf of himself and the rest of the Inhabitants and Owners of Houses and Lands lying against the Sea at Margett aforesaid, the same setting forth the great Danger the said Town is in of being carried to Sea, and the great Losses already befallen the Estates of many of the Inhabitants, by the carrying of many of their Houses already to Sea, through the Decay of certain Jetty-works heretofore made for Defence thereof; and praying that Timber may be appointed for repairing of the same, as also that Money may be raised for the perfecting thereof out of the Arrears of a Scot of Two Shillings per Pound, heretofore charged upon the Houses and Lands there, and of another Scot of Thirty-six Pounds per Annum laid upon the Pier of Margett by the Commissioners of Sewers for the East of Kent, about Twenty-five Years ago, the Payment thereof having been for some Years discontinued; and that, for the future maintaining thereof, the said Scots may be confirmed; or that, in Lieu of a Moiety of the said Two Shillings per Pound, a reasonable Poundage may be set upon certain Commodities going into and out of the said Island, a List of which Commodities, and of a Rate proposed to be set upon them respectively, was now presented; and upon reading of a Certificate from some Gentlemen of the County of Kent (to whom the State thereof was referred by this Committee to be viewed and certified), they thereby setting forth that, the said Jetty-works being by them surveyed, and Workmen consulted, they found that Fifty-five Rods of Work is in Decay, which, requiring Double Work, will take up Six Hundred and Five Tons of Oaken Timber; that the Workmanship will amount to as much or more Charge than the Timber; and that there will need a continual Charge to keep it for the future: And for that this Committee is informed, by some Members of both Houses, that they have viewed the same, and find the Defects and Danger of the said Town to be very great; and forasmuch as the same is within the Jurisdiction of the Cinque Ports: This Committee doth therefore conceive it their Duty to represent it to both Houses of Parliament; and doth recommend it to them, That the present Defects may be repaired, and sufficient Timber for that End allowed; and that the Town may in Time to come be secured by a Scot upon the said Houses and Lands, or by a Poundage upon Commodities exported and imported from and to the said Island, or otherwise as they shall in their Wisdom think fit; as also that Consideration may be had of the Petitioner John Smith’s Disbursements for upholding of the said Works (which, by his Petition, is alledged to amount unto Four Hundred and Twenty Pounds), in such a Way as they shall think meet, he having offered (as by the said Certificate is mentioned), upon Allowance of a Moiety of the said Scot, and of a Poundage upon the said Commodities, to perform the said Work (being first furnished with Timber as aforesaid) and to engage an Estate of One Thousand Pounds Value to keep the same for ever: And it is lastly Ordered, That a Copy of the said Certificate, and of the Schedule of Rates upon the said Commodities, be annexed to this Report. The Committee produced a detailed financial plan of ‘Monies to levy, to maintain the Jetty-works at Margate, in the Isle of Thannett, in Kent, against the Sea, for ever’.17 Some of the required money would come from the Pier Wardens: ‘That the Pier Wardens at Margate may pass over the Accompts to the Mayor of Sandwich and Dover; and, as they shall think fit, that Half the Overplus may be paid to the Expenditor, towards the Maintaining of the Sea-works at Margate for ever, the Pier having for Twenty-five Years and more paid Thirty-six Pounds per Annum, as by the Scot appears.’ The rest of the money would come from the houses and lands that would gain from the sea-works but, rather than the two shillings in the pound that had been charged on such properties for the last twenty-five years, only one shilling in the pound would be charged, the difference being made up by charges imposed on goods landed at the Pier, such as 7d for each quarter of wheat, malt and salt, 8d for every pack of wool transported to London, 5d for every hundred North Sea cod-fish, 2d for every hundred mackerel, 2d for every hundred weight of ‘Holland Cheese, Cheshire and Thin Cheese’, and so on, in great detail; a full list of these charges is given in Appendix V.
Petition of gentlemen, freeholders, and yeomen, inhabitants in the Isle of Thanet, to the Committee for the Admiralty and Cinque Ports. Petitioners and their predecessors have, time out of mind, shipped their corn at Margate, and have always been and still are ready to pay all ancient and accustomed duties for the maintenance of the pier and harbour. These duties hitherto have been, and still are, sufficient for the purpose, and the town is not in that danger which is falsely suggested in the petition of John Smith. The inhabitants will undertake to maintain the works now standing against the sea, with a moiety of the timber desired by Smith, and without any new imposition laid upon the country, which would compel petitioners and their successors to ship their corn elsewhere, to the utter ruin of the inhabitants. Pray that the old duties may be maintained, and that they may be collected and disposed of by pier wardens chosen as they have been accustomed to be chosen time out of mind. Letter from Henry Crispe, sen., and Henry Crispe, jun., at Queakes [Quex], to the Earl of Warwick. Having been directed by the Committee to survey the decays of the jetty works at Margate, they have made their report. They have seen both the petition presented by Smith, and also that from the inhabitants of Margate, who, for the real performance of the works and safety of the town, faithfully promise to give six times the security proffered by Smith. This the writers desire may be taken into consideration. Upon debate before the Honourable Committee of Lords and Commons, for the Admiralty and Cinque-ports, of the matter in difference touching the repairing, sustaining, and keeping of Jetty-workes against the Sea at Margate, in the Isle of Thanet, for preventing the destruction and swallowing up of the said Town of Margate, by the violence of the Sea breaking in upon it. And upon hearing of John Smith, Expenditor for the said Town, and his councell on the one side. And of Sir Henry Crisp, Henry Crisp Esq., Richard Hartie, Jeffery Sandwell, John Broxland, Marke Ambrose, Tho. Smith Senior, George Somner, John Tomblin, Wil. Coppin, John Pannell, James Hannaker, and Richard Jenvey, and their Councell on the other side. Upon the whole businesse there arose two Questions. The first, How the said Jetty-works might for the present be repaired, and for the future maintained, so that the Sea might be kept from breaking in, and the said Town might be preserved? The second, How the said Smith, the Expenditor might be satisfied and reimbursed the monies and charges he had laid out, and been at in this publique and common businesse, for the time past? And as to the first, the said Sir Henry Crisp, Henry Crisp Esq., Richard Hartie, Jeffery Sandwell, John Broxland, Marke Ambrose, Tho. Smith, Senior, George Somner, John Tomblin, Wil. Coppin, John Parnell, James Hannaker, Richard Jenvey, and their Councell did offer, That if the repairing of the said Jetty-workes and the keeping thereof, might be entrusted to them, they would with 200 Tunne of Timber, to be allowed unto them for the said worke for the present sufficiently repair the said Jetty-works, and make them defensive against the Sea, and safe guard and preserve the said Town of Margate, and every part thereof, and of the Lands thereto belonging, against the violence and breaking in of the Sea, as well for the present as for the future for ever hereafter, without any further tax, allowance or charge, to be yeilded, made, paid or imposed therefore, but only a scot, or tax of 12 pence in the pound, to be levied and paid out of the Houses erected against the said workes, and to be paid but once in the year and no oftner. And for the performance thereof in every particular, viz. as well for the present repairing, as future sufficient keeping the same for ever, upon the rate aforesaid, and without any further demand. The said parties before mentioned did by themselves and their Councell, make offer, to put in sufficient Security, as this Committee or the Honourable Houses should approve and like of; which being accepted and yielded unto by the said Smith the Expenditor; the Committee thought fit that the same should be subscribed by the said parties, to remain with this Committee, or be presented to the Honourable Houses, as should be requisite. And as to the second Question, touching the charge and disbursments of the said Smith, for that the parties could not agree upon the same, nor how and in what manner they had been laid out. It was humbly praied, That a Commission might be ordered to issue out of the Court of Admiralty of the Cinque-ports, to examine witnesses upon such matters, interrogations, and questions, as the said Smith for his part might see cause for the better ascertaining of the said disbursments, and charges by him expended; And wherein the said other parties might joyn and counter examine likewise if they thought meet. That so examinations being duly taken, they might be returned to this Committee, whereupon this Committee might be truly informed of the true state of the matter; and so give such order for relief of the said Smith, as they should hold just and equitable. To the Right Honorable the Committee for the Admiralty and the Cinque-Ports. These are further to informe your Honors, That whereas the Jetties of Margate, in the Isle of Thanet, and County of Kent; and the great danger of the said Town, have many times and late been discussed before your Honors, and whereupon your Honors out of a commisseration, and due consideration, of the danger of the said Town and Inhabitants there; have been favourably pleased to grant some convenient quantity of Timber, for the better defence of the said Town and Inhabitants there, against that raging and mercilesse Element, the Sea. And whereas it hath pleased God on Sunday last past, (being the 12 day of this instant March,) to send a most tempestuous tyde, against the said Town, (as at other places) by reason whereof, a great part of the said workes is broken down, and some part of a House of this bearer John Smith, is demollished; and whereas not only the estate there of the said John Smith, but of many other the Inhabitants of the said Town, are (if not very speedily secured) like to come to utter ruine and decay. The premises considered, May it yet again please your Honors, to take the deplorable condition of the said Town and Inhabitants, into your speedy and mature consideration, and to afford such a quantity of Timber for the defence of the said Town and Inhabitants; and also to appoint and ordain some able man (whom your Honors shall thinke fit) to take care of the said workes, as in an exigence of so much concernment and danger is required. In witnesse whereof, we your Honours humble petitioners have subscribed our hands (Inhabitants of the said Town) the 13 day of March, Non salutis, 1647. Subscribed by the Inhabitants of Margate. IN reading the Petition of John Smith Expenditor for the Works against Margate, concerning the deficiency of the said Works, his charg[...]s in attending that businesse of the Isle of Thanet, the delaies used by some that have addressed their Petition to this Committee in opposition of his; by their not standing to what had been mutually agreed before some of this Committee, and proposing away for repaire of the said Works, and keeping of them for the future. Ordered that Henry Crisp Esquire, George Summer, William Coppin, Thomas Wheatley, Edward Brooks, and Stephen Bishop, doe attend this Committee on this day three weeks, by themselves or some of them, or some other on their behalf, sufficiently instructed to answer the said Petition, and failing thereof, this Committee will proceed to settle such resolution upon John Smith’s said Petition, as shall appear most meet, without further delay. the Commission of Sewers be desired to take the . . . charges and expenses he hath been at about the said Jetty Works beyond his receipts, into their Consideration and afford him all lawful manner and assistance for reimbursing his said moneys as by the law and their said Commission they may be enabled to do. And that the said Commissioners are further desired to hear and review such information and other fit proposals as the said Smith shall offer unto them for the finding out which way the said moneys may be lawfully gotten up for his satisfaction. And to certify their opinions thereon to this Committee. The Council (having taken into consideration the enclosed petition of John Smith) have thought fit to desire you to take the petitioners case with the charges and expenses he hath been at about the Jetty works at Margate in Kent beyond his receipts into your consideration, and afford him all lawful means [of] assistance for reimbursing his said moneys as by the Law of Sewers you are enabled to do; And you are further desired to hear and examine such witnesses and receive such informations and other fit proposals as the said Smith shall offer unto you for the finding out which way the said money may be lawfully levied for his satisfaction and to certify your opinions to us what you have done. It is clear that there was considerable sympathy for Smith in the Counsel of State and at the Admiralty Committee, but it is unlikely that this resulted in any action, as in May 1650 it was recorded by the Council of State that ‘the order formerly given to the Commissioners of Sewers for the Isle of Thanet, upon the petition of John Smith, late expenditor of the works against the sea at Margate, be now renewed, upon the petition of Sarah, widow of John Smith’.26 The unfortunate John Smith had died still waiting for recompense, the Pier Wardens remained a law unto themselves, and the pier remained in a state of decay. The first surviving book of Pier Accounts dates to 1678, suggesting that some reform of the management of the pier might have taken place at this time.29 The Pier Wardens in 1678 were Thomas Grant and Joseph Mackwith and their accounts show that in the year 1678-1679 the Pier had receipts of £145 11s and spent £90 19s 11½d mostly on small items, but including £1 4s 8d ‘for digging 148 loads of chalk’ and £3 14s for carriage of these loads of chalk ‘to fill up the new work’, showing that some work on the Pier was underway. The accounts were kept in the simplest manner and the profit (or loss) at the end of one year was simply carried over to the following year and added into that years accounts which, unfortunately, makes it difficult to compare the financial positions in different years. Humbly showeth that whereas the pier of Margate is very much beaten down and ruined by the general rages of the sea and the stock of the said pier is all expended towards the Maintenance of the same we therefore the said pier wardens for the time being with the assent and consent of the other inhabitants of the said parish for the better maintenance of the said pier for the future have thought fit to propose some additions and alterations to be inparted in the dues of the said pier which we humbly desire your hand would be pleased to allow and confirm. A memorandum of agreement in the Pier Accounts book gives more detail, although it is still not clear exactly what was being agreed to. It seems that a proposal for a new cess (tax) to pay for Pier repairs would be dropped and that those that had been petitioning for the new cess, together with a group of other parishioners, would, respectively, contribute sums of £20 and £10 each, and if that was not sufficient, they would split the extra contribution required in an equal proportion. It was proposed that work would start by Michaelmas 1681, and that six out of the 32 persons involved in the agreement would be chosen to monitor expenditure, and that two of these six would be chosen as the two Pier Wardens appointed each year. Unfortunately, the pier accounts for the year 1680-1681 are not sufficiently clear to identify what was spent on maintenance that year. However, it is clear that expenditure in the following year, 1681-1682, was relatively high, with total receipts of £128 2s 4d, including carryover from the previous year, and a total expenditure of £126 17s 10½d. The accounts for the year 1682-1683 included £14 for ‘expenditure on Iron Works’ and £23 for ‘expenditure for plank and timber’, suggesting some significant rebuilding of the Pier. The following year, 1683-1684 was worse, with total receipts including carryover of £109 14s 9d which, with a total expenditure of £168 8s 7d, meant that the following year the Pier wardens started with a debt of £58 8s 10d; the accounts for the year included large sums spent on the purchase of timber. Luckily this debt was paid off the following year as in 1684-1685 the total expenditure was only £49 0s 9d, with a positive balance of £21 3s 2d at the end of the year. The balances at the ends of the years 1685-1686 and 1686-1687 were £12 17s 11d and £15 15s 9d, respectively. However, a statement at the end of the accounts for 1686-1687 confusingly states: ‘It appears . . . that the pier was in debt by £64 4s 1d less £15 15s 9d gives £48 8s 4d debt’ suggesting that the Pier at some stage had taken on a significant level of debt, possibly from the arrangement of January 1680 described above. The year 1687-1688 was not a good one as it was necessary to ‘repair the breach at the Pier’ made by a bad storm. In January 1688 the ‘poor inhabitants of the parish of St John the Baptist in the Isle of Thanet’ petitioned the King ‘showing that by a storm and tempest a great part of the pier of Margate was beaten down, the repairing thereof will amount to £250, for raising which they have made an assessment, and praying his Majesty to confirm it and empower the collectors to collect it’.30 The King apparently was ‘willing to give all fitting encouragement and assistance’ but there is no report of anything actually being done.30 The accounts for that year show total receipts of £107 9s 3d but a total expenditure of £284 4s 8d, leading to a debt of £176 15s 5d at the end of the year. The total cost of repairing the breach in the Pier was £176 17s 4d, a noticeably smaller sum than the initial estimate of £250; a detailed breakdown of this expenditure is given in Appendix VI. The accounts confirm the picture of the pier as a rickety structure, taking the form of a box of wood, packed with chalk. No payments are recorded for any survey of the damage, or for anyone to oversee the work. For long periods of the year there are payments for nine or ten labourers to work on the pier, with large numbers of payments ‘for bread and beer’ for them. Old timbers and planks were saved, presumably to be reused in the repairs; ‘old plank’ was bought at Chatham, ‘1164 foot of ships plank’ was bought for £12 3s, and ‘new plank’ was bought from Maidstone, but there is no mention of the purchase of any stone. Twenty two pounds fifteen shillings and one penny were spent on ‘spikes and nayles’ to hold the planks together. Payment was made for 154 loads of chalk and for baskets, probably to be filled with the chalk and used to pack the pier; 7 labourers were paid 16s 6d for ‘1 day and a half work to fill the pier with baskets’ and 3s 11d was spent ‘for ropes to draw up the baskets’. The accounts also include a charge of £4 1s for the costs incurred in January 1688 when ‘the Deputy and I [one of the Pier-wardens] went to London, our charges for 11 days for our selves’; this was to present the petition to the King described above. On the 10th and 13th days of October and the 8th of December last, by the violent blowing of the north-west wind, part of the pier called the “New Pier” was carried away, and that part of the town which is guarded by the pier and jetties, is so laid open that it is expected to be washed away if the wind should blow fresh at north-west. The repairing of this will cost £2,500 as appears by oaths taken before the Mayor and Jurats of Dover, and by the opinion of Sir Christopher Wren, who viewed the same in January last; and the townsmen, being already so much in debt, are not able to do these repairs without some help from their Majesties, and without such repairs, their town will be entirely destroyed by the storms which usually happen in winter. The petition was passed on to the Lord Committee of the Admiralty but the outcome is not known. However, the Pier wardens Thomas Underdowne and Roger Laming actually spent just £13 6s 10d in the year 1691-1692 on repairing the pier, including 5s spent in June 1691 ‘for Vincent Barber, John Smith, James Yeoman for taking their oath’s before the Mayor and Jurats of Dover what the repair of the pier would cost and a certificate upon the same.29 Full details are given in Appendix VII. The gist of the agreement is clear even though some of it is now illegible. Fortunately, a covenant entered into with 55 of ‘the inhabitants of St John Thanet’ fills in some of the missing detail.32 The covenant makes clear that the ‘undertakers’ had agreed to rebuild the pier and pay off its debts, on the understanding that they would receive 5 % interest on their loan until the loan had been paid off, the money coming out of the profits of the pier, and that the two pier wardens chosen annually by the inhabitants would be chosen from among the twelve ‘undertakers’. Dissent continued in the town over pier charges, and Henry Lord Viscount Sydney, the Admiral of the Cinque Ports, felt it necessary on 7 February 1694 to confirm the decrees under which the pier was managed, publishing his ‘Orders, decrees, and rates, time out of mind used by the inhabitants of Margate and St John’s in Thanet . . . for and towards the perpetual maintenance and preservation of the pier and harbour of Margate . . . newly revised, ratified, confirmed and allowed, by his Excellency the Right Honourable Henry Lord Viscount Sydney . . .’ (Appendix VIII). THAT all and every person and persons which do dwell or at any time hereafter shall dwell in Margate and the parish of St John’s aforesaid, or any other person or persons whatsoever which shall have occasion to use or harbour in the said Pier at Margate with their boats or vessels either lading or unlading of any kind of victual, goods, or any other kind of merchandize whatsoever, or in any other sort or manner do use or have any trade, traffick or dealing in the said Pier, shall well and truly stand to, pay, obey, discharge, observe, fulfil and keep, all and singular the ancient cus­toms, orders, decrees, payments and agreements, whatsoever there used, and all other hereafter in these presents contained, upon the pains and forfeitures hereafter mentioned. Item 11. That every person or persons whatever, that shall bring into the said Pier or Harbour any quantity of salt, salt-fish, butter, cheese, coals, wood, or any other durable commodities, to the intent to sell the same there, shall first give public notice thereof tothe country by the common cryer there appointed, and shall lie the space of three days after such public notice given, to the intent that the country may buy for their needful provisions, upon pain to forfeit 10s and that no inhabitant of Margate and St John’s, or any other person or persons whatsoever, shall buy, forestall, or ingross the same com­modities, or any part thereof, to sell out by retail again, until the said three days be expired, upon pain to forfeit the commodity or commodities, so bought contrary to this article, or the value thereof; after which time it shall be lawful for any towns-man, or other, to buy the same commodities. And that no inhabitant or ports-man shall take upon him to own the goods or merchandizes belonging to any foreigner or stranger, to the prejudice of the Pier or Harbour, upon the pain above specified in this article. Item 30. It is further ordered, decreed and appointed, that all the sum and sums of money before mentioned, either to be levied, paid or forfeited, shall wholly be used, employed and bestowed, to the use, benefit and maintenance of the Pier or Harbour aforesaid, as need shall require, by the direction of the Pier-Wardens for the time being. Item 32 . . . And if it should chance (as God forbid it should) that either, by tempestuousness or rage of weather, or any other casual means whatsoever, the said Pier or any part thereof be overthrown and beaten down to the ground, then the Inhabitants and Pier-Wardens aforesaid shall within twenty days next after the beating down of the same, assemble themselves, and make a cess, either to discharge the Pier-Wardens of all such sum and sums of money as they stand bound for, to any person or persons, for and towards the use and behoof of the said Pier and Harbour, or else shall build and make up the said hurts with as much speed as maybe. Fortunately, the ‘undertakers’ stood by their agreement to provide funds for rebuilding the Pier, and the Pier accounts for 1693-1694 include receipt of a sum of £20 from each of the 12 undertakers named in the agreement, ‘towards rebuilding the new pier head and paying debt.’ The reference to ‘rebuilding the new pier head’ is obscure, but at least it is clear that the Pier wardens had it in mind to improve the pier, and not simply patch it up one again. With a sum of £9 16s 8d ‘left in our hands of the last years accounts’ the Pier-wardens were able to pass on £249 16s 8d to Roger Omer, ‘Gent’, and Valentine Jewell, Pier-wardens for the following year. Expenditure in the year 1694-1695 was high, £312 5s, including large amounts for workers’ wages and loads of chalk, leaving a deficit at the end of the year of £8 15s 2d. The Pier Wardens for the following year, Valentine Jewell and John Brooman were, however, able to turn this into a small positive balance of £21 5s 8d, and receipts and expenditure seem to have remained pretty much in balance for the rest of the century. Up until the year1701-2 the two Pier wardens were chosen from the list of the ‘undertakers’, in accordance with the agreement made with them, but in 1702-3 Walter Tomlin and William Norwood were chosen, possibly because the loan from the ‘undertakers’ had by then been paid off. In May 1696 the Pier Wardens took the opportunity of William III’s passing through Margate on his way to Holland, to present him with a petition asking for payment of a grant of £100 that had been awarded some time earlier for the repair of the pier. The King was sympathetic and, it is recorded, ‘recommends the payment of the hundred pounds . . . formerly granted for the repair of the said pier, which has been already laid out on that service’.36 It is unclear whether or not the £100 was forthcoming. Whereas William Payne, gent, and Valentine Hogbin, mariner, do refuse to pay towards the maintenance of the pier of Margate . . . according to the decrees of the said pier – Now know you that if the said William Payne or Valentine Hogbin or either of them of any other person do or shall bring a cause to be brought . . . against Roger Omer or John Turner present Pier wardens for executing the office according to the decrees of the pier . . . That we the parishioners of the parish whose names are hereunder written do hereby promise in the behalf of the parish that we will . . . indemnify Roger Omer and John Turner in defending the suit if it commenced by William Payne and Valentine Hogbin. The petition was signed by 40 of the inhabitants. That the Deputy of St John’sfor the time being shall yearly, the Sundaybefore May-daycause public notice to be given in the parish church of St John's, immediately after divine service in the forenoon, to the inhabitants that shall be there present, that they shall assemble themselves together upon May-day next following, at some convenient place and hour, to be appointed by the De­puty: And there the Deputy with the greater number of them which shall be there present shall make choice by voices (and the Deputy to have a double voice) of two Wardens, commonly called Pier-War­dens, and also two Deputy Pier-Wardens, chosen to execute the said office when and so often as the said Pier Wardens shall be absent, or otherwise not able to execute the office of Pier-Wardenship; upon pain the Deputy neglecting his warning of the inhabitants of Margate and St John’s shall forfeit 10s. The following account is what I can give you, of what damage is done in this Island in the late great storm; in this town [Margate] hardly a house escaped without damage, and for the most part of them the tiles blown totally off from the Roof, and several Chimneys blown down, that broke through part of the Houses to the Ground, and several Families very narrowly escaped being kill’d in their Beds, being by Providence just got up, so that they escaped, and none was kill’d; the like Damages being done in most little Towns and Villages upon this Island [Thanet], as likewise Barns, Stables and Out-housing blown down to the Ground in a great many Farm-houses and Villages within the Island, part of the Leads of our Church blown clear off, and a great deal of Damage to the Church is felt. At Margate the Sea made a free passage over the new pier-head, beat down the light that guided vessels into port, threw down the gun-battery, and forced the can­non into the sea; some shops and ware­houses on the shore were washed away, and a great number of small craft were dashed to pieces. Memorandum: That whereas the parishioners being met together 13 November 1705 to consider what measures to take to collect some arrears due to the harbour from refusing to pay the same, we whose names are under written, do hereby empower the present pier wardens Peter Sackett and John Turner to go to Counsel and have advice and take such measures as the law shall direct in that case for to recover the same. Memorandum that at the same time as above that Mr Tho. Grant did affirm that he had but thirty six tun of Kelp in arrears for which said Kelp he then paid eighteen shillings, and forty three quarters of barley and ½ for which he paid four shillings, in all one pound and five shillings in full for poundage to May day last past. Memorandum: that on the 11th day of August 1708 at a public vestry being lawfully called it was then and there concluded and agreed by us whose names are under written (being the majority of voters) to build and set up a Jetty and make a sufficient way for the use of the pier where the sea hath washed away the same being near the pier and joining to the land and premises of Joseph Jewells heirs and David Austins heirs which Jetty and way so to be built and made. 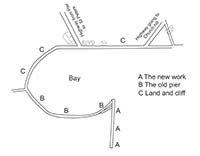 We do hereby authorize and appoint Mr John Brook and Roger Whitehead present pier wardens to so make such a Jetty and convenient way to the pier at the discretion of the said pier wardens as shall be for the best advantage and conveniency for the use of the pier. Witness our hands dated the day and year first above written. In that year the expenditure was £165 16s 1d against receipts of £173 2s 9d so that John Brook and Roger Whitehead were able to pass on only £7 6s 8d to the following year’s pier wardens. A Petition of the Pier-Wardens, Masters of Ships and Vessels, and other Inhabitants, belonging to Margate, in the Isle of Thanet, in the County of Kent, was presented to the House and read; setting forth, That, there being a Bill depending for continuing a further Term for repairing Dover Harbour; That the Petitioners, by way of Contribution, have expended very great Sums of Money for repairing the Pier and Harbour of Margate, over and above the Income thereof; and must, every Year, on account of the Sea’s lying harder on it than usual, lay out more than the Revenue therefore will amount unto; without which the said Pier or Harbour of Margate must fall to decay; to the great Prejudice of the Estates and Inhabitants of that Island; And praying, That the Ships and Vessels belonging to Margate may be exempted from Payment of any Duties towards the Repair of Dover Harbour. That there has been built, time immemorial, a Pier of Timber, for the De­fence of the Town of Margate from the Sea, and a Harbour for Merchant Ships and Boats, and for Corn Hoys, to carry the Produce of the Isle of Thanet to London Market: That on the Preservation of the said Pier depends not only the Safety of the said Town, but the In­terests of the several Estates in the Isle of Thanet: That the said Pier has hitherto been supported by certain Droits or Duties, paid for several Commodities landed, or put on board, in the said Pier; the Payment of which Droits or Duties have been confirmed by Orders and Decrees of the Lord Wardens of the Cinque Ports, under whose Jurisdiction the Town of Margate is; but that, of late, the Payment of the said Duties has been disputed by several ill-minded and contentious Persons: And praying, That the Petitioners may be enabled more effectually to recover the said several Duties, for the keeping up, and preserving, the said Pier. Sir Edward Knatchbull reported from the Committee, to whom the Petition of the Inhabitants of St John Baptist, and Town of Margate, and of the neighbouring Parishes of St Peter the Apostle, St Laurence Minster, Monckton, Birchington, and St. Nicholas, at Wade, in the Isle of Thanet, and County of Kent was referred, the Matter, as it appeared to them; and which they had di­rected him to report to the House; and he read the Re­port in his Place; and afterwards delivered it in at the Clerk’s Table: Where the same was read; and is as fol­lows: viz. That the said Committee, pursuant to an Order of the House have examined the Matter of the said Petition; and do find, upon the Examination of several Witnesses, the same to be as follows; viz. That the said Pier is a great Preservation and Safe­guard to Merchant Ships, in time of War, from the Ene­my’s Privateers lurking about the North Foreland; who take them as they sail from the River to the Downs. Valentine Jewell produced the Book of Account of the said Pier; whereby it appeared that, one Year with another, for seven Years last past, the Duties amounted to about £140 or £150 a Year. Mr Brooke said, That several of the Inhabitants, which are Hoymen, have refused to pay the said Duties, alleging there is no Law to compel them to it. And the Petitioners produced many other Witnesses to prove the Matter of the said Petition; but the Committee did not think fit to trouble the House with the Report of any further Examinations. Ordered, That Leave be given to bring in a Bill, to enable the Pier-wardens of the Town of Margate,in theIsle of Thanet, more effectually to recover the ancient and customary Droits for the Support and Maintenance of the said Pier: And that Sir Edward Knatchbull, Sir Robert Furnese, Sir George Oxenden,Mr Attorney General, Mr Milles, and Mr Onslow, do prepare, and bring in, the same. To carry out the task of collecting the droits the Pier Wardens and Collectors were authorized to go on board any ship ‘belonging to the said town and port of Margate, making use of, or being within the said pier or harbour of Margate’, calculate what was due ‘in respect of any goods, wares, or merchandise then on board’, and then collect this money. If payment was not forthcoming, they could seize goods and ‘guns, tackle, furniture and apparel’ belonging to the ship, and then, if payment was not received within ten days, sell them. Finally, the Act stated that all sums of money collected should be paid to the Pier Wardens, to be ‘laid out and employed in and towards the repairing, improving and continually keeping in good repair, the said pier and harbour of Margate, and shall not be applied or disposed to any other use, intent or purpose whatsoever.’ This final requirement confirmed the previous restrictions on using the droits to maintain the jetties along the shore line. The Pier rates established in 1693 were still in use in 1784 and are listed in Appendix VIII, and the Pier and Harbour at Margate were maintained under this Act until 1787 when Margate’s first Improvement Bill was passed. Figure 24. An early eighteenth-century English hoy, from William Sutherland, 'Britain’s Glory or ship-building unvail’d', London, 1717. 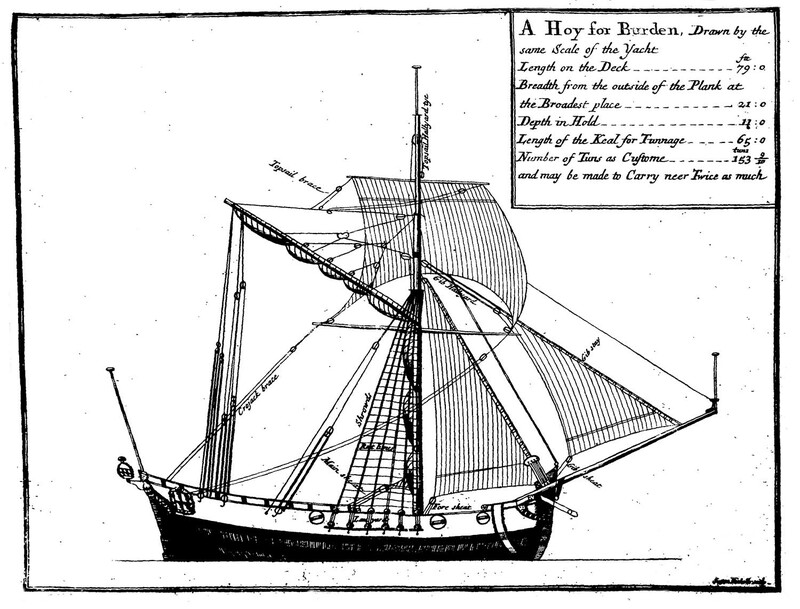 Most of the corn shipped from Margate to London was carried in hoys, ships of cutter-rigged design that had been developed at the estuary port of Faversham (Figure 24).52,53 The hoys had to be sturdy enough to weather rough seas, shallow enough to enter an estuary, and fast enough to make regular passages.52 They originally had open holds but by the early eighteenth century these had been ‘decked-in’, and their tonnage had increased from between 20 and 30 tons to sixty tons burthen (the method of calculating the cargo capacity of a ship in terms of its burthen is described in Appendix IX).54 Other ships such as the slower brigs and other square-riggers were used on the coal trade to the north, and for the Baltic timber trade. To the treasurer and the barons of the exchequer. Writ of supersedeas in respect of their demand against Peter Popr and John Jory of the isle of Tanet or either of them to render account of wheat, barley, malt, beans, pease or other victuals needful for furnishing the town of Calais which, by Letters patent of 20 April II Richard II, they were appointed to buy and purvey from time to time for the king’s moneys wheresoever within the realm within liberties and without, the fee of the church excepted, and order to discharge them, releasing any distress made for that cause; as Roger de Walden the king’s clerk, treasurer of Calais, has borne true witness in chancery that the commission was not delivered to them, neither did they meddle in aught therein contained, having no knowledge thereof. Grant, pursuant to the ordinance of the king’s progenitors that no purveyor should take victuals or grain from Canterbury to the sea-shore to wit, from the shore extending 12 miles inland in breadth and in length from Sandwich to Apuldore, but that those parts should be reserved for the victualling of Calais and the marches there and Dover castle and the officers and ministers there, — that no purveyor take oxen, sheep, calves, swine, capons, hens, chickens, corn or other victuals of any person within the said precinct, nor in the Isle of Thanet, the hundreds of Maydeston, Hayhorn and Twyford, save the victualler and purveyor of Calais and the marches there and Dover Castle, Calais and the marches being now in great need. A letter to the Commissioners for the Restrainte of Graine and Victualls within the countie of Kent signifieing unto their Lordships that notwithstanding the Generall Restrainte made as well within that countie as in other counties of the Realme againste the transportacion of graine beyonde the seas, there are of late viijt [eight] shippes with wheate and maulte laden within the Isle of Tennette and at Sandwich arrived at Sluce in Flaunders, and that sundry other shippes to be laden with graine in Kent are expected to come unto the place aforesaid and other parties in that cuntrye, they are therfore required fourthwith not onlie to examyn what shipps have departed from those places laden with anie kynde of graine, what quantities have ben shipped by them, by whom and by what licence, and theruppon to certifie the personnes and their doinges accordingly that order maie be taken for the meeting with their offence, and hereafter to have a more vigilant regard to the execution of her Majesties Commission addressed unto them in that behaulf. There are certain here [Calais] who have obtained licence to transport beefs, muttons, wheat, oats, malt, beer and other victuals, "under a colour for the Lords [Commissioners] provision," which are being passed over for the Prince of Parma, and there are now great provisions of such things shipped from Margate, Ramsgate, Sandwich and Dover, "whither to be transported God knoweth . . . The enemy will be glad of victual, and will stand in as great need as before, if they were not so plentifully every day resorted unto. — Calles, the last of March, 1588." A letter to Customer Smith that whereas of the number of two hundred and fouretene buttes of swete wines lately brought by an Argosie [a type of large Venetian merchant ship] lieng presently at Margett, and sent by one Lewes Erizzo, a Venetian, there was by order from our verie good Lord the Erle of Leicester unladen threscore and thre buttes and fower carettalles (sic), the rest of the same wines, being afterward for verie good reasons stayed from being landed, remayning at this presente on boarde or in divers hoyes upon the ryver of the Thames, amounting togither, with the quantitie yet remaining in the Argousie, to one hundred and fifty buttes or thereaboutes; forasmuche as it hath bene declared unto their Lordships that the furder contynuance of the said wines on boarde the hoyes and Argousie might bringe greate hurte and daunger of spoile unto them upon peticion made in that behalf, their Lordships have thought good to requier [him] to take order that the same wines maie be landed, and to take the same into his custody and so to remaine unsolde and well looked unto without any diminishing thereof (at the charges of the said Erizzo), untill their Lordships shall have taken furder order for the same. An order concerning a fatt [a fatt was a measure of capacity; one fatt held 9 bushels, and one bushel held about 9 gallons] of Silks brought from Dunkirke belonging to Robert Cudenor of London, Marchant. Whereas there was this day presented to the Boarde a Peticion of Robert Cudenor of London, Marchaunt, wherein he doth remonstrate that there was landed at Margat in Kent one small fatt of silke, which came in a Shallop that brought English Prysoners from Dunkerke, which saide Fat of silke doth belong to the Petitioner, and were sent over lande from Italy, and now is at Margat and there deteined by one Smith, upon no other pretence then because it came from Dunkerke, the same having beene deteined in his Custodie about twoe monethes alreadie, to the Petitioners greate hinderance for which Cause he doth humbly sue that in paying all due charges of Custome he may have his goods delivered unto him: Their Lordships having taken this his humble Sute into consideration doe thinke fit to graunt the same, the rather in regarde that Phillip Burlemachy, Marchaunt, doth undertake for the truth of that which is alleagcd in the said Petition. Hereof the Lorde Treasurer is prayed and required to take notice, and to give presente and effectuall order to the Officers of the Porte of Margat for the delivery of the aforesaid Fat of silke to the Petitioner or his Assigne without dilay. An order concerning foure bailes of Silke, Lined Cloth belonging to Samuel Alderson, John Bowater and others. Whereas a peticion was this day presented to the Board by Samuell Alderson, John Bowater, John Parker and William Burley, all Natives and Subjects to his Majestie, in which they remonstrate, that they have foure bailes and twoe trunkes of Silke, linin Cloth, and other commodities not prohibited landed at Margat, which goods doe belong unto them, as may appeare by oth and otherwise, some of the said goods being come out of Italie over lande, and others having bene taken for debts long forborne; all which goods being landed are stayed by his Majesties Officers, because thay came from Dunkerke; whereas the peticioners had no other meanes to have them brought, seing they cannot come through France without danger of confiscation, whereupon the said petitioners doe humblie sue that the said goods may be delivered unto them, paying his Majesties Customes. Their Lordships having taken this their humble suite into consideration, doe thinke and order that if they can make sufficient proofe of this which they alledgc, before the Judge of his Majesties High Court of Admiralty, all the aforesaid goods shalbe delivered unto them. Whereof the Lorde Treasurer is hereby prayed and required to take notice and upon the said proofes being sufficient to give order accordingly. On Tuesday last a Hoy, bound to Margate in Kent, turning to windward under a hard gale of wind, was unhappily overset between Erith and Woolwich, by which accident about 30 passengers were all lost. That every other ship, crayer, hoy, or any other vessel that doth come into the said Pier or Harbour only for succour, and not to lade or unlade, shall pay according to their burthens, viz. of ten tons and under 4d, of twenty tons and under 6d, of thirty tons and under 8d, of forty tons and under 12d, and those of greater burthen to pay accordingly; and for aliens double the rate. The Pier Accounts for the years following 1732 give a lot more detail and a typical set of accounts, that for the year 1 May 1733 to 1 May 1734 is given in Appendix XI. The accounts clarify how the finances were handled. On 1 May each year the old pier wardens handed over any cash remaining from the previous year to the two new Pier Wardens. The new Pier wardens were allowed to keep up to £100 of this cash as a ‘stock of running cash’ to fund repairs and improvements to the Pier, and, it seems, were allowed to keep for themselves any interest they might receive on this money; this would be some recompense for the time they devoted to the job, which was unpaid except for a sum 5s a year paid to them ‘according to custom.’ The first item of income listed for the year 1733-34 was the sum of £224 16s 10d received from the Pier wardens for the previous year. The next item, and the largest source of income for the Pier, was for shipment of ‘corn’ from the pier. The shipments were divided into ‘heavy grain’ and ‘malt’. Wheat and corn were classed as ‘heavy grains’ when transported by sea as they stowed more closely than barley or oats, which were termed ‘light grains’; the rate charged for transporting light grain was higher than for heavy grain because the rate was calculated on weight rather than on volume. The total shipments of wheat and corn were 19,040 quarters with 8013 quarters of malt. The grain was shipped by eleven men, the greatest quantities by Stephen Baker, John Simson, John Stoacks, Stephen Swinford, Richard Laming, and Daniel Pamflett. Receipts for colliers for the year 1733-34 show 19 shipments of coal in the year, totalling 1087 chaldrons. Nine men were responsible for this trade, eight of whom were probably from Margate. Fish landed at Margate were mackerel, herring, whiting, and red herrings, mostly by Margate boats, with red herrings bringing in the largest income for the pier, £10 6s 10d. Small items included wine, butter, timber, salt, sugar, hemp and kelp, although there is no way of knowing from the accounts whether these were imports or exports. The number of ‘town ships’ going on longer voyages were small. In 1733-34, Capt. Brooks paid £1 for ‘four voyages’ and Mr Bowman 10s for ‘two voyages’. The accounts for 1732-33 give more detail, with Mr John Tibb paying 15s for three voyages ‘to the East Country’ and Richard Bowman paying 15s for three voyages to Portugal. Item 21 of the Orders of 1693 (Appendix VIII) established that half the value of any wrecked goods saved by a vessel coming into the harbour, or half the value of any saved anchors, would be taken by the Pier Wardens. In 1733-34 fourteen anchors were saved, adding £1 3s to the Pier accounts. For wrecked ships the pier received 2s 6d in this year from John Randall ‘for getting the sugar out of the ship upon Girdle sand’, 6s from ‘William Ladd and others for getting the sugar ship off the said sand’ and 19s from ‘William Ladd and others for ½ a share of their saving sugar out of the said ship’. In the previous year Capt. Brooks had paid £7 12s 6d to the pier ‘for 166 bales out of a Turkey ship’, and Stephen Swinford, John Staner and John Harison had paid 10s 6d, 5s and 2s 6d respectively ‘for an half share [of their] earnings out of the Turks ship upon the Woolpack Sand’. The accounts for 1733-34 include amongst the receipts from tenants of the Pier, £8 from ‘the Collector of Sandwich for a year’s rent’; the Collector of Sandwich was head of the Customs establishment at Sandwich, which covered the harbour at Margate (see Chapter 5), and the accounts for 1744-45 show that the rent of £8 paid by the Collector was for ‘the storehouse and Watch house.’ The next highest rents received were rents of £3 10s received from H. Swinford and John Stoacks. Just three years later, in 1737, we hear that John Stoacks ‘late of Margate . . . Mariner or Hoyman’ was in prison in Dover Castle for debt.81 Also imprisoned in Dover Castle for debt in 1737 was John Simson, ‘late of Margate . . . a Hoyman’;82 it is not known if the problems faced by Stoacks and Simson were linked or not. Richard Watts to Williamson. We heard last night from Margate that a Dutch fleet of capers appeared in sight of the North Foreland, and had both English and French colours. They took within these four days four Margate vessels, one brand new that had not been twelve hours out of Margate pier. Another from Bradster (Broadstairs), in the Isle of Thanet, reports that this morning the Dutch capers took the boldness to fetch three ketches from Broadstairs pier mouth. So that several vessels that yesterday and to-night resolved to go to Newcastle, have laid up in the several piers of Thanet and Sandwich, and if speedy care be not taken our people will starve for want of fuel in the winter. the inhabitants of the towns of Ramsgate and Margate are become owners and proprietors in a great number of ships using the Levant Seas and are considerably concerned in the fishery of these Kingdoms, which fish is for the most part consumed in Italy, and your petitioners observe with great grief that there is now depending in your Lordships House a Bill to repeal so much of the Act of Navigation as permits the importation of goods of the growth of Asia into Great Britain, by which restraint your Petitioners will lose a part of the freight of their ships in their return to England and the burthen will lye wholly on the outward bound cargo, which will render the same delivered at market very dear and hinder the consumption of fish and other manufactures of these Kingdoms. Wherefore your petitioners humbly hope that the said Act will not pass which in its consequences must be very detrimental to your Petitioners and the navigation of these Kingdoms. The Fish generally caught here are Whitings, (which are often no bigger than Smelts) Wraiths, Wilks, Red and White, Lobsters, Pungers, Oysters, and Eeles. Of these last (I have been told by the old Fisher-men) such Plenty has been caught here formerly, that they used to measure them by the Bushel; but for these many Years past they have been very scarce. as the passage from England to Holland is reckoned the shortest from this place, it has had the Honour of being often visited, of late Years, by great Personages who have gone over thither. Thus, in particular, that Noble Asserter and Defender of the Rights and Liberties of Mankind, and particularly of those of Great Britain, K. William III of glorious memory often came hither in his way to and from Holland. His present most excellent Majesty has twice landed here. Her Royal Highness the Princess of Wales came first on shore at this place, and that successful and victorious General the late Duke of Marlborough used to choose this for his place of going abroad and landing when he went and came to and from the several Campaigns he made. The seventh of April being Thursday, 1636. His Excellency departed from Greenwich for Germanie, tooke Barge about three of the clocke in the morning, and landed at Gravesend, from thence by Coach to Canterbury to bed, the next day to Margate where wee dined, and about three of the clocke in the atternoone, hee tooke shipping in one of the Kings Ships called the Happy Entrance, and landed the tenth day being Sunday at Helver-sluce. Oct. 20. Last night King William came to town from Margate, having had a mighty favourable wind to bring him from Holland thither in 24 hours and so home that day. He took shipping upon Sunday in the morning, about 7 o’clock, all his guards and retinue who went to bring him home were disappointed, thinking he would have come by Harwich; but coming the other way he was forced to send to the country gentlemen, and the people to conduct and guard him home on his journey. A gentleman’s coachman turned over the coach wherein was himself, Lord Churchill, Lord Portland, and Mons. Overkirk, or the Duke of Ormond, I am not certain which, but I do not hear that any great damage was done, only Churchill complained of his neck being broken; the King told him there was little danger [of that] by his speaking. Monday October 13, his Majesty landed at Margate in his return to his British Dominions; and as there were none of his own coaches there waiting for him, he was received from the Boat, which brought him to the shore, into a chaise belonging to Mr Carr, Collector of the Customs at Deal, which carried him to Capt. Hercules Baker’s, and in his Chariot his Majesty was carried to Canterbury, where he was taken up by his own Coaches, and about nine at night arrived safe and in good health at St James’s. The story of this event recalls the legend of George II’s visit in 1745. According to the London Magazine the journey was uneventful: ‘On Saturday, August 31, about four in the morning his Majesty landed at Margate from his German dominations, and having passed thro’ the City [of London] at one in the afternoon, amidst the repeated acclamations of his people, arrived at Kensington Palace in good health’. The local version, as reported in a letter to Notes and Queries in 1881 is more colourful: ‘His Majesty once landed here in the middle of the night, on some crazy steps — which have lately disappeared — and was taken to a house, still standing, in King Street, to sleep. Local tradition further states that an old lady preceded him with a tallow candle in a lantern, and said at the corner “Oh, please, Mr King, mind the puddle”’.117 Some doubt the veracity of this tale.